The Jackson Family Foundation (AKA Jackson Family Heritage Foundation) 501(c)3, is a not for profit organization established by Joseph and Katherine Jackson soon after the June 25, 2009 tragic passing of their beloved son Michael Jackson and is spearheaded by Jackson Family Foundation President & Co-Founder, Simon Sahouri. 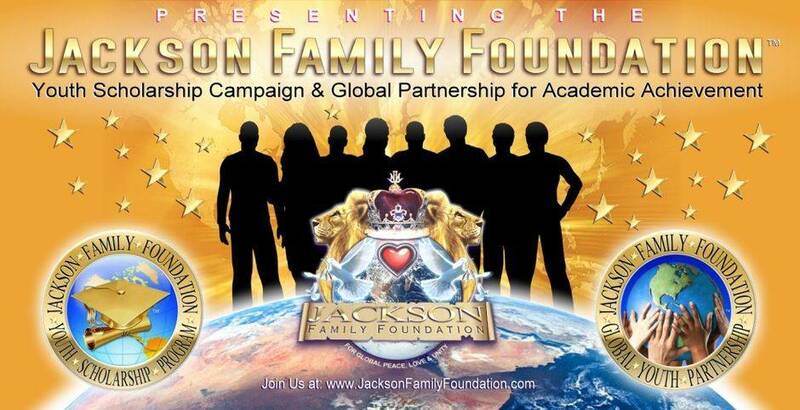 The Jackson Family Foundation is 100% committed to advocating the advancement of "Global Peace, Love and Unity" as well as the support of multicultural, social, educational, musical and artistic projects and industry collaborations which carry on and/or strongly emulate the historic philanthropic, charitable and humanitarian works of Michael Jackson, and the entire Jackson Family Foundation. Please feel free to make a Tax Exempt Donation below. The Jackson Family Foundation endeavors to help encourage unity between all cultures and people, and to support disadvantaged children and youth of all ages through education, youth mentoring programs and scholarships for those who may have the ability to excel in the arts, music, sports and entertainment by enhancing their outlook on life and instilling in them an inspirational vision for their future. The primary message that we want to instill in all youth is that there is nothing in life that they can’t achieve if they just simply put their mind to it. Portions of all donations will be earmarked for the establishment of our "Jackson Family Foundation Youth Scholarship Program". We "Thank You" in advance for your kind and generous support of our Jackson Family Foundation (AKA-Jackson Family Heritage Foundation) and its Charitable Mission. Learn more about our Chariotable Mission, Goals & Objectives at; www.JacksonFamilyFoundation.com and join our Jackson Family Foundation Global Network Today! We are thankful to you and happy to express our deepest gratitude for whatever dollar amount you may choose to donate. Whatever amount you choose to contribute will be very much appreciated and will be put towards the operations of our Jackson Family Foundation and its Charitable Mission. All donors will be provided a "Letter of Thanks" on our Official Jackson Family Foundation Letterhead. You can print out your PayPal Receipt as confirmation of your donation to our charity for your corporate or personal Tax Filings. We genuinely wish you "Peace, Love and Unity" and want to "Thank You" again for your tremendous support! COPYRIGHT © 2019 JACKSON FAMILY FOUNDATION / LEGACY OF THE LEGEND SPECIAL EVENTS, NEWS, NETWORKING & PRODUCT SALES BLOG - ALL RIGHTS RESERVED.